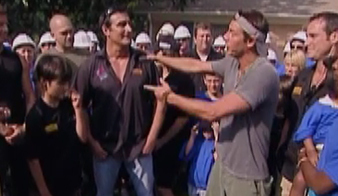 New Home Builder Richard Merlini Has Been Chosen By ABC Extreme Makeover To Build Two New Homes In Two Different States. The first Extreme Makeover build was for the Gilliam family in Aramada, Michigan in 2006. The second Extreme Makeover build was for the King family in Charlotte, North Carolina in 2008. Richard Merlini of Live Well Homes Holds record for fastest build, Completed 2 homes in 2 different states. In August of 2006, Richard Merlini embarked on a once in a lifetime journey to help a young firefighter’s widow (Maryann) and her six children in Armada, Michigan. After 53 hours he was able to complete a safe, new home for the Gilliam family. Around two years later in July of 2008, Richard Merlini and a crew of dedicated partners and friends were able to complete a second Extreme Makeover house with attached daycare, this time for the King family in Charlotte, NC.